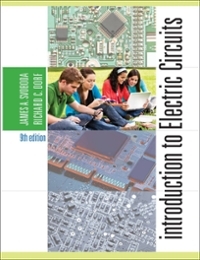 Introduction to Electric Circuits 9 Edition Known for its clear problem-solving methodology and it emphasis on design, as well as the quality and quantity of its problem sets, Introduction to Electric Circuits, 9e by Dorf and Svoboda will help readers to think like engineers. Abundant design examples, design problems, and the How Can We Check feature illustrate the texts focus on design. The supporting online WileyPLUS learning environment enables the assignment and assessment of specific concepts using a full range of pedagogical features. The 9th edition continues the expanded use of problem-solving software such as PSpice and MATLAB. WileyPLUS sold separately from text.